All exposed and thrilled w my lineup (you can see in my profile), and all chose FGY as the machine to hit "start" first!!! (kind of surprised me). They ended up playing several machines and loved them all.....just curious as to your experience, and possible theory or a pattern.....is there a machine that always gets the initial attention? Maybe it's the most familiar popular media to them in the line-up? I noticed its usually a super popular license or a simpler game that attracts the noobs. TNA. It's the easiest one to understand, people have more fun when they're not just flailing and understand the goals. Back when I still had it runner up might be Scared Stiff. Mata Hari is always a hit with non pinheads because it doesn't look too intimidating and the rules are pretty straight forward. Nonpinheads will gravitate to SW on their own. That's usually not a great experience for someone who doesn't know what they're doing so I'll redirect them to TNA or MMR and get a much better response. The game in the middle gets the most attention at home at first (other games in the lineup are in the workshop). Nine Ball is the simplest and "retro." After playing for awhile DH and IJ get more attention as more of the ruleset is understood. The game in the middle gets the most attention at home at first (other games in the lineup are in the workshop). Nine Ball the simplest and "retro." After playing for awhile DH and IJ get more attention as more of the ruleset is understood. Usually Stellar Wars because it’s the largest of the four I have. Rob Zombie is almost always the initial favorite (definitely the one that gets the biggest reactions [given, my guests are in the age-range that would gravitate toward RZ]), but Ghostbusters is ultimately the favorite amongst guests with eventual lost interest in RZ (MET was also a favorite, but I traded mine awhile back [do miss it at times, but doubt I'd get another one]). Since Iron Maiden has been here, Ghostbusters is still preferred by guests despite being here for over two years. My SoF and BK are in a non-common area of the house, so they don't get the initial spotlight to really observe if they'd attract initial attention. For me it's the 16' ball bowler. All them pinballs and everybody wants to bowl. The guys my age like those two games too! Mine is Stikes N Spares and Slugfest. People just flock to the novelty pins. I find they make for the most heated battles. Always stern star trek LE. AC/DC BIBLE followed by WOZ and The Hobbit. I think it's awesome how many "mainstream" favorites don't get the first nod to those that don't play often. Obviously, I choose titles based on my preference, but to a non player, can be pretty diverse for sure..
Hobbit gets the most love from my guests. Followed by my EM and WOZ. Now that I have F14 Tomcat back, curious to see if that takes over. As for kids, they go straight to the virtual pinball cabinet. Some of them have no idea how to even start a pinball machine (what's a plunger? ), but they are comfortable around something more akin to a video game. For non pinheads RFM, CFTBL, Iron man,and transformers. When pinheads do come over they usually play Mac attack, x files, RZ, and TWD. Getaway - because it's my only pin! Pin wise its TSPP overall its the ball bowler or Skeeball every time. Ice Cold Beer. 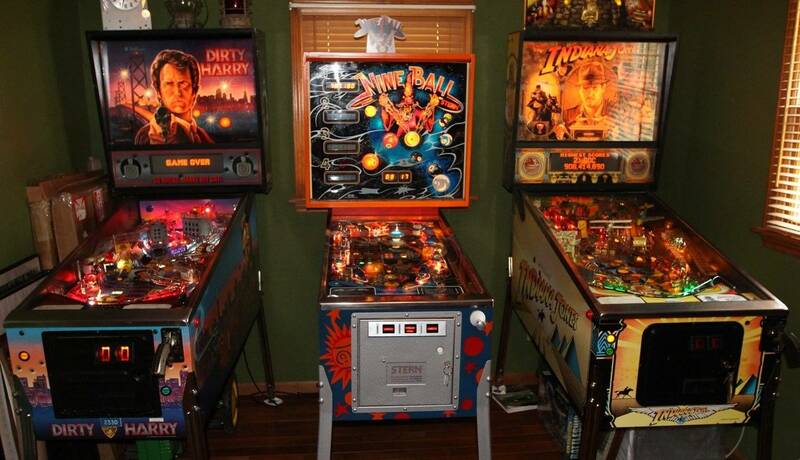 I know its not a pin but Ive got about 10 really nice pinballs and even pinball people play ICB when they come over. 2nd in line is probably MET. I had a halloween party on Saturday, they all played TAFG, however it was the only machine I had out. Counter said it got played 85 times! I should've taken it off free play. Aerosmith gets played the most by far. Had one of my teenage daughters friends play continuously for hours , even by herself while all others were watching football. Put on 4 player games and played all day totally focused. Poor kid never beat my high scores though. ST Pro is 2nd, but not nearly as much as AS. TNA for adults, Stern Star Wars for kids. At my house, people gravitate towards two pins, Stle for the guys and Woz for the women. It seems to be because they have the brightest attract modes with the color sweeping leds. The ems don’t get a lot of love until you show folks how to start them, then people get into them (not having a green flashing start button doesn’t help, lol!). Daytona USA 4 seater by a wide margin. I could honestly host parties with just those. Skeeball is a close runner-up. For pinball machines MM and TSPP are a close tie for first place. Third: Star Trek next Generation. I only have a large gathering once a year, and the ball bowlers get played pretty much non-stop. The Skee Ball gets much attention, and the same with many of the EM Arcades..
gets their share of play..
NGG and AFM, although people really seem to like classic JP because of the dinosaur. I would say after playing it people like WOZ the most. There's just so much to do. TZ, FGY, and DILE in a line. FGY usually gets the first guest play. My regular guests usually flock to Pit Stop first. Flintstones but only if they've been here before.